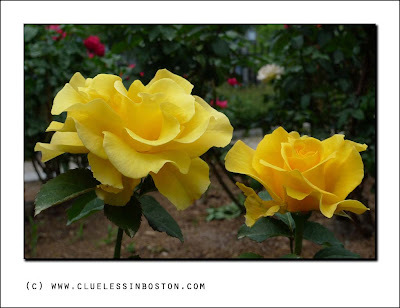 Yellow roses from the Rose Kennedy Memorial Garden. I had never visited this garden before. It has 103 rose bushes in honor of Rose Kennedy, one for each year of her life. bushes in bloom must be a sight to see. I like this romantic idea of a rose bush for every year of a life..At the end, your life becomes a wonderful garden. Tash is right: this is a perfect image of perfect flowers. I haven't seen in completed it. It looked great even part way done though. I love yellow roses...well, I love pretty much all roses. We are grateful that you have visited this garden now!It's wonderful! Are these as fragrant as they are beautiful? A nice tribute to a wonderful lady. Three thoughts came immediately to mind: These are gorgeous; great photo--very sharp; what year of her life do these represent? The last thought was just silly. Wonderful shot! I had forgotten that she lived so long! They are stunning! What a wonderful way to remember her. Now we know there are at least 103 types of roses. Yellow ones are my favorite! !